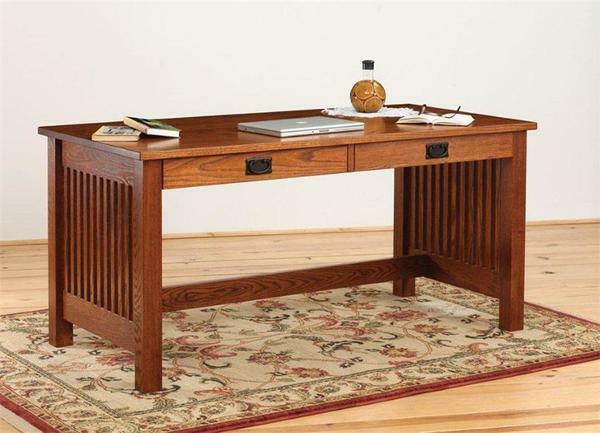 Classic, clean lines characterize our Amish Holmes Mission Writing Desk and are sure to inspire creativity of all kinds! American made and available in 3 different sizes to suit any space. You'll have plenty of room to get the job done on this solid surface. Keep clutter at bay with 2 spacious dovetailed drawers. All of your working essentials will be neatly housed away in the beauty of an heirloom quality desk. The solid wood construction of the Holmes is available in your selection of 11 different hardwood options. Oak wood is standard for your new Mission writing desk. We have it pictured topped off with Michael's Cherry Stain, making for a handsome addition to your office, entryway, and beyond. Finish samples are available and we'd be more than happy to send them out in order for you to confirm your choice for this Mission office furniture. The Holmes hails from the heart of Ohio Amish Country. The wood shop where it is constructed with care has been passed down from the father who started the company to his son. The legacy continues and that will be evident in every inch of this writing desk. Excellence is consistently strived for and you will be able to tell each time you make use of this lovely piece. These woodworkers know the importance of family and are dedicated to providing your home with only the best. Please give us a call to get started on creating the Amish furniture of your dreams: 866-272-6773. Inside Drawer Depth: 3 ½"